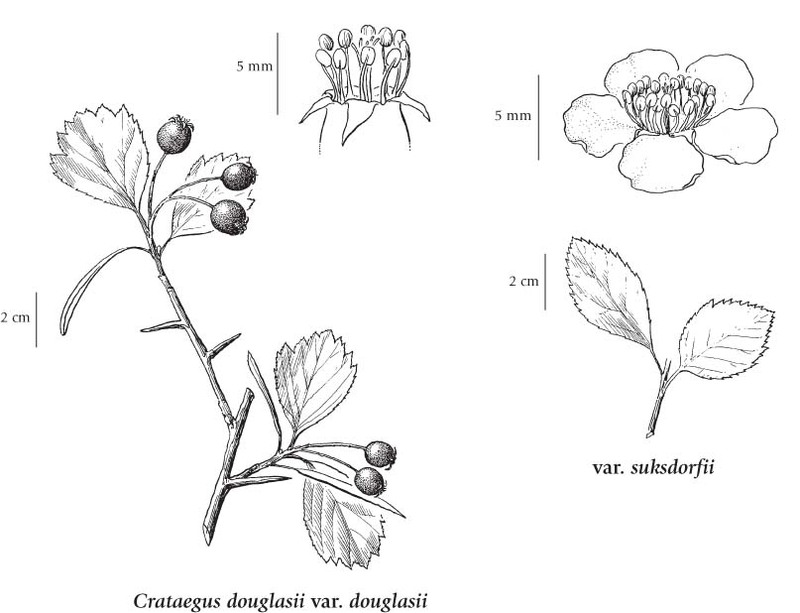 Black hawthorn is a medium to tall shrub species frequently found in southern British Columbia. It has white flowers with 5 petals that appear in the spring; alternate simple leaves, and straight, stout thorns. View a key to the hawthorns of the Pacific Coast (from Alaska to California), and species notes, by Jim Phipps. Medium to tall shrub 1-7 m tall, with stout, straight thorns 1-2 (3) cm long; bark grey or brownish, rough and scaly. Alternate, deciduous, egg-shaped to oval, 3-6 cm long, irregularly toothed, the top end often with 5 to 9 shallow lobes, somewhat thick and leathery, dark green above, paler below, nearly smooth to hairy. Inflorescences short, terminal or axillary clusters; flowers several to many, stalked, 1-1.5 cm across; corollas white, the petals 5, nearly circular, 4-7 mm long; calyces 5-lobed, the lobes triangular, somewhat long-hairy toward the tip; ovaries inferior, smooth to short-curly-hairy, the styles usually 5; stamens 10 to 20. Berry-like pomes (like miniature apples), globe- to egg-shaped, about 1 cm long, blackish-purple, smooth; stones (nutlets) 2 to 5, 1-seeded. 1. Flowers mostly with 20 stamens; ovaries usually smooth; leaves merely 1- to 2-times saw-toothed; plants from west of the Cascade Mtns........................ var. suksdorfii Sarg. Moist to mesic, open rocky slopes, bluffs, streambanks, lakeshores, gullies, thickets, edges of forests in the lowland to montane zones; frequent in S BC north to 56o N; N to S AK, E to ON and S to SD, WY and CA. A shade-tolerant/intolerant, submontane to montane, North American deciduous shrub distributed in the Pacific, Cordilleran, and Central regions. Occurs on very moist to wet, nitrogen-rich soils (Moder and Mull humus forms) within boreal. temperate, cool semiarid, and cool mesothermal climates. Sporadic in open­canopy forests on water-receiving sites, scattered in poorly forested, semi-terrestrial communities on water-collecting sites (swamps). Characteristic of nutrient-rich wetlands.